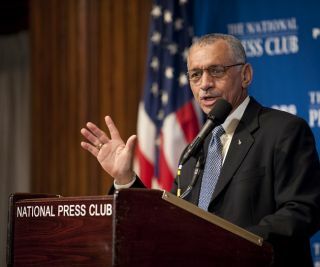 CAPE CANAVERAL, Fla. - NASA chief Charles Bolden said Saturday that he takes full responsibility for the shock and surprise from employees and lawmakers after learning that President Barack Obama had cancelled the space agency's plan to build new spaceships to send astronauts back to the moon. Bolden, a retired Marine Corps general and former space shuttle commander, told reporters it was his fault the Monday announcement from the Obama administration caught people inside and outside the space agency off guard. "You're looking at the guy responsible. I will take the heat," said Bolden, who spoke on the eve of the planned Sunday launch of the shuttle Endeavour from the Kennedy Space Center here. On Monday, President Obama ordered the end of NASA's Constellation program as part of the space agency's 2011 budget request. The new NASA direction, if approved by Congress, would scrap plans for the Orion spaceships and Ares rockets that were envisioned to replace the agency's aging space shuttles. The Constellation program was also aimed at returning astronauts to the moon by 2020, but an independent panel found last year that NASA lacked the funding to meet that goal. Instead, Obama directed NASA to put more support behind commercial spacecraft, which would be used to launch astronauts instead of the now-shelved Orion and Ares vehicles. NASA's space shuttle program is due to retire later this year after five final space missions. With the fleet's retirement looming, shuttle managers said Friday that there has been a feeling of shock and angst among the spaceflight work force. Bolden said that NASA could have better prepared its employees and members of Congress, some of whom have spoken out emphatically against the new plan. The NASA budget request, which actually included a slight budget boost up to $19 billion, would cut out the Constellation completely, extend the International Space Station's mission through at least 2020, and set aside $6 billion over five years to support commercial spacecraft development. It would also increase funding for fundamental research, Earth science and development programs for ground-breaking technology for space exploration. Senator Richard Shelby (R-Alabama), who represents a state that's home to NASA's Marshall Space Flight Center in Huntsville, Ala., called the Constellation program cancellation the start of a "death march for the future of U.S. human space flight" in statement this week. Bolden said the tough job lies ahead, when he will have to meet with members of Congress to explain the new NASA direction and budget should be approved. He is also meeting with NASA employees, people who are now more worried than ever about the future. With the Orion and Ares programs eliminated, many jobs will be lost when the shuttle fleet retires. Bolden said he empathized with employees here at NASA's Kennedy Space Center during an all-hands meeting on Friday. He is also urging some of the top contenders for commercial spacecraft construction and launches to come to Florida and consider using the existing workforce and infrastructure already in place at NASA's launch facilities. "I what them to come to town to live," Bolden said. "I don't want them to come in, fly and go back….that means they've got to bring some things here. Assembly, maybe production." One example is revamping NASA's cavernous Vehicle Assembly Building, a towering, 52-story building that has been the main assembly room for space shuttles, Bolden said. It was built during the Apollo era to assembly the Saturn V moon rockets that sent astronauts to the moon the first time. Now shuttles are attached to their 15-story fuel tanks and solid rocket boosters inside. The building could be repurposed after the shuttles are retired to accept more than one type of rocket, such as the Falcon 9 boosters under development by California-based Space Exploration Technologies (SpaceX) or other firms, Bolden said. NASA has a contract worth $3.5 billion in total with SpaceX and Virginia's Orbital Sciences to launch unmanned cargo ships to the International Space Station. The first Falcon 9 test launch is expected sometime this year. "We can to where everybody wants to go a lot quicker if we adapt what's here, as opposed to trying to build all new," he said, adding that there will assuredly be some new construction required. "I'd like to utilize the facilities we have here."